The Cree are scattered today throughout the northern portions of six provinces from Newfoundland (Labrador) to Alberta. In the days of the fur trade they were primarily a forest people who lived in small family groups. Some of the western Cree who ventured into the plains became successful buffalo hunters. They prospered and multiplied, lived in large bands, and in the course of time became known as the Plain Cree. The Swampy Cree or Muskegon, the Home Indians of the Hudson's Bay Company, inhabited the swamp area north of Lake Winnipeg. Their close relatives the Wood Cree occupied the territory between Moose River (Ontario) and the central and northern portions of Lake Winnipeg. Though the Cree are all of Algonkian stock, there were originally several differences between the three divisions, the most noticeable being linguistic, behavioral, and dress. Linguistic differences have persisted to the present day. All the Cree in Manitoba today, probably 16,000 or more, are classified as Swampy Cree. 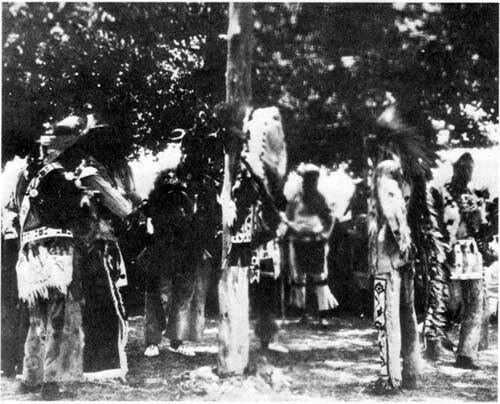 Swampy Cree assembled in Council Meeting, Poplar River (date unknown). Poplar River flows into Lake Winnipeg about 70 miles south of Norway House. Swampy Cree encampment, Shoal River, 1889. Shoal River drains Swan Lake into Dawson Bay, at the northwest extremity of Lake Winnipegosis. 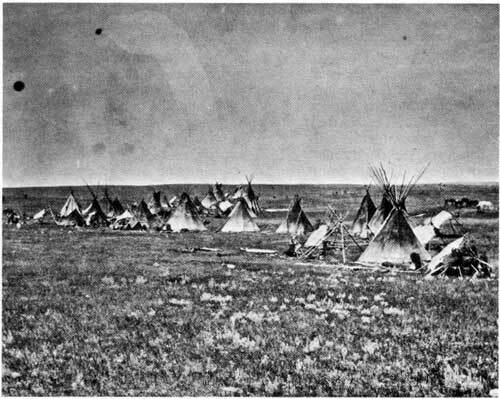 The prairie tribes lived in tipis or teepees, the name being derived from the Sioux ti-dwelling and pi-used for, literally then, used for a dwelling. 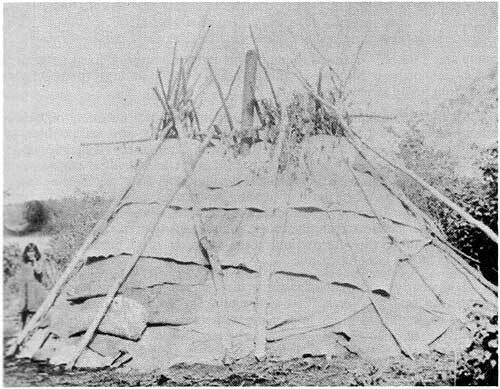 A tipi with a diameter of 18 feet at the base and with a height of about 20 feet was made of twelve to fourteen buffalo hides. 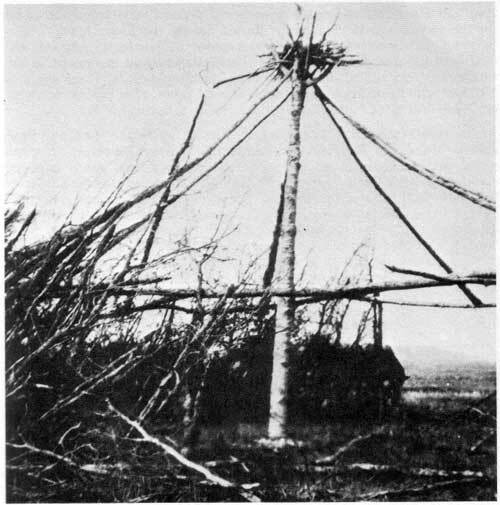 When the tipi was properly erected, the hide fitted tightly over the poles, the lower rim being weighted down with stones (and sometimes fixed with pegs). The slender trees which were used for poles came to be known as lodgepole pine, and among the older Indians there used to be bandied about the quip: a good set of tipi poles is worth more than a wife. The Saulteaux, like the Cree, are of Algonkian stock. It is generally assumed that they came to Manitoba in the early years of the 1700s during a migration westward from Sault Ste. Marie, hence Saulteaux. In Ontario they are called Ojibwa, in Minnesota and Wisconsin they are known as Chippewas. The Ojibwa were once the strongest numerically of all the Algonkian people, and they occupied the lake and river frontages from Lake Huron to Lake of the Woods and into Manitoba's Whiteshell. They are now spread down the eastern flank of the province from Berens River to Roseau River - and in other places. There are now twenty-seven Saulteaux bands in Manitoba with a total population of some 16,000. Saulteaux birchbark wigwams were either cone-shaped or dome-shaped. The birch-bark was moved from place to place but the saplings were left behind. (Photo - Berens River, 1930s). The original Sioux in Manitoba, the Assiniboine, were a dismembered branch of the Dakota (Dakotah) family, the name meaning "allies" or an "alliance of friends." 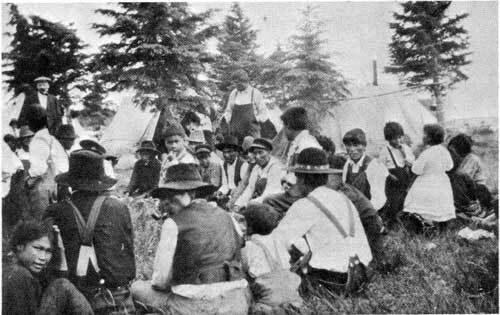 The Sioux in Manitoba today are the descendents of the refugees who sought asylum in Canada following the Minnesota Massacres of 1861 and the Indian War of 1876. There are four Sioux bands in Manitoba, the Birdtail Sioux at Uno, the Long Plain Sioux at Portage la Prairie, the Oak Lake Sioux at Pipestone, and the Oak River Sioux at Griswold. Their total strength is about 1,500. 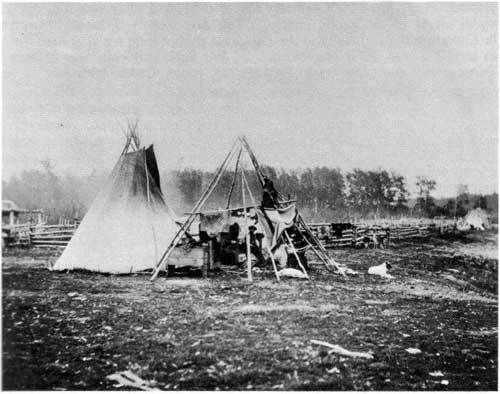 Sioux camp on Boundary Commission Trail (1874). Unlike wigwam poles which were discarded when camps were moved, tepee poles were carefully preserved and moved from place to place. In the spring the scattered bands of Sioux would gather together and set their teepees in a large circle around a Sun Dance Lodge. The dance was usually held as a ceremony of thanksgiving for delivery from some danger or affliction. A large pole, used as the centre upright, was put in place with appropriate ceremony. Then it was beaten with coup sticks (as though it were an enemy). It was finally assuaged by fixing to it strips of colored cloth or small blankets of eagle feathers. The Sun Dance is still performed, and the photo on this page, taken in the 1930s, is proof of its performance in the 20th century. The photo was taken by permission of a certain chief who asked that the place of the dance be kept secret. The Chipewyan are of Athapascan stock. They once held sway throughout a large area in Northern Manitoba and occupied all the territory north of Churchill River as far west as Great Slave Lake. 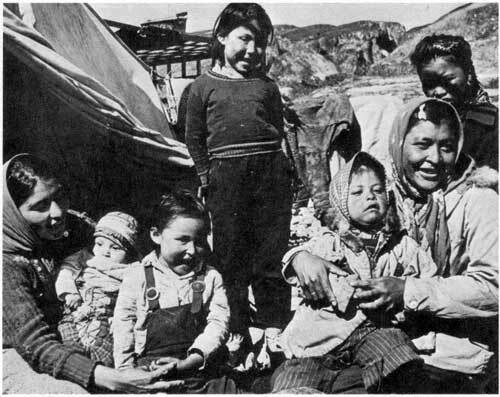 The Chipewyan at the height of their strength might have numbered 3,500, but many were killed in skirmishes with the Eskimo and the Cree, and many were destroyed by smallpox. There may be some 1,000 Chipewyan left in Canada today. Only two bands are left in Manitoba, one at Brochet and the other at Churchill. Their total strength in Manitoba is about 700. Chipewyan on Cape Merry, Churchill, Manitoba.